East Aurora, NY | December 19, 2018–Astronics Corporation (Nasdaq: ATRO), a leading supplier of advanced technologies and products to the global aerospace, defense, and semiconductor industries, today announced the appointment of Mark Moran to its Board of Directors, effective December 14, 2018. The addition of Mr. Moran as an independent director brings the Astronics Board to nine directors, eight of whom are independent. He will serve on the Compensation Committee and the Nominating and Corporate Governance Committee. Mark Moran, age 62, brings significant aerospace engineering and operations experience spanning nearly 40 years. He spent 17 years with Continental Airlines prior to its acquisition by United. During his tenure, which included eight years as the head of Operations, Continental grew to the fifth largest airline with 2,600 daily flights to over 260 airports. He retired from his position as Chief Operating Officer with Continental in 2012. Prior to that, Mr. Moran served ten years with USAir/Piedmont, and before that, five years with Boeing Corporation (NYSE: BA). He is a graduate of Marquette University, where he earned a Bachelor of Science degree in Engineering. East Aurora, NY | December 17, 2018– Astronics Corporation, a leading provider of advanced technologies for the global aerospace, defense, and semiconductor industries, announced today that its wholly owned subsidiary Astronics Test Systems received an Innovators Award for its ATS-6100 WFT (Wire Fault Tester) from Military & Aerospace Electronics Magazine. The judging panel consisted of a group of senior, expert professionals in the field of military & aerospace technology. time domain reflectometer (SSTDR) technologies, it safely and precisely locates both hard and soft faults in wiring and insulation. The Windows-based tablet platform helps prevent catastrophic failure and unnecessary replacement of aging equipment for both military and commercial applications. This is Astronics’ second Platinum Innovators Award from Military & Aerospace Electronics; the CTS- 6010 Tactical Radio Test Set received a 2017 award. East Aurora, NY | November 14, 2018– Astronics Corporation (Nasdaq: ATRO), a leading supplier of advanced technologies and products to the global aerospace, defense, and semiconductor industries, today provided initial 2019 revenue guidance for its Aerospace segment and affirmed recent Aerospace 2018 revenue guidance. EAST AURORA, USA | November 5, 2018 – Astronics Corporation (Nasdaq: ATRO), a leading supplier of advanced technologies and products to the global aerospace, defense, and semiconductor industries, today reported financial results for the three and nine months ended September 29, 2018. Results for the quarter and the first nine months of 2018 include the results of Telefonix PDT, which was acquired on December 1, 2017 and Custom Control Concepts (“CCC”), which was acquired on April 3, 2017. Earnings per share for all periods are adjusted for the 3 for 20 (15%) distribution of Class B Stock for shareholders of record on October 12, 2018. East Aurora, USA | October 30, 2018– Astronics Corporation, a leading provider of advanced technologies for the global aerospace, defense and semiconductor industries, announced today that its wholly owned subsidiary, Astronics Test Systems, has received the Global SMT & Packaging Journal’s 2018 Global Technology Award in the test equipment category for its ATS 5034 System-Level Test (SLT) Platform. The Global SMT & Packaging Journal presented the award on October 17, 2018 at the SMTA International 2018 conference in Chicago, Illinois. The ATS 5034 SLT Platform received the award based on the following criteria: innovation, speed/throughput improvements, quality contribution, cost benefits, environmental consideration, ease of use/implementation, and maintainability. Jon Sinskie, Astronics Test Systems’ Executive Vice President of Semiconductor Test, accepted the award on the company’s behalf. Astronics will highlight the ATS 5034 SLT Platform at the International Test Conference (ITC) in Phoenix, Arizona, October 30 through November 1. The ATS 5034 SLT Platform uses system-level test to examine at-speed and functional performance characteristics of the device under test (DUT) to find defects missed during traditional ATE functional testing. Essentially, it tests the device in “mission-mode” or its end-use environment. East Aurora, USA | October 15, 2018–Astronics Corporation (Nasdaq: ATRO), a leading provider of advanced technologies for the global aerospace, defense, and semiconductor industries, announced today that the FAA recently granted Parts Manufacturer Approval (PMA) for the next generation of LED Landing and Taxi Lights, provided by its wholly owned subsidiary Astronics Luminescent Systems Inc (LSI). With this designation, these advanced LED lights are approved for use on commercial, business, and general aviation aircraft. Astronics Luminescent Systems Inc. (LSI) is the supplier of choice for lighting systems for aircraft cockpits, cabins, and exteriors. With products ranging from avionics panels and light plates to anti-collision and formation lights to emergency cabin lighting and passenger information signs, Astronics LSI collaborates with customers to create reliable, optimal solutions. Forerunners in the industry with the innovative use of LED, HID and electroluminescent lighting technologies, LSI products provide illumination and safety for commercial and military aircraft worldwide. East Aurora, NY | September 24, 2018–Astronics Corporation (Nasdaq: ATRO), a leading provider of advanced technologies for the global aerospace, defense, and semiconductor industries, announced today that its wholly owned subsidiary Astronics Connectivity Systems and Certification (CSC) has shipped more than 10,000 cabin wireless access points (CWAPs) to enable inflight connectivity systems on aircraft. With this milestone, Astronics’ CWAPs serve as the most broadly accepted 802.11ac CWAPs in the market today. East Aurora, NY | September 19, 2018 – Astronics Corporation (NASDAQ: ATRO), a leading provider of advanced technologies for the global aerospace, defense and semiconductor industries, announced that its wholly owned subsidiary, Astronics AeroSat, recently received the Civil Aviation Administration of China (CAAC) Validation of Supplemental Type Certification (VSTC) of its satellite communications (SATCOM) connectivity system. 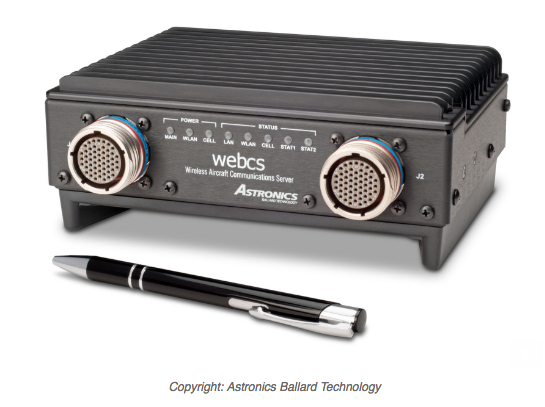 Specifically, the VSTC validates Astronics AeroSat’s FliteStream F-310 connectivity system and its new ARINC 791-style AeroShield radome and adapter plate system. Complete data for this inflight entertainment and connectivity (IFE&C) solution is available in CAAC VSTC0870. Astronics AeroSat’s AeroShield radome and adapter plate solution is the only next-generation ARINC 791- style solution that provides optimal Ku-band performance combined with the lowest drag design, while meeting all FAA & EASA bird strike safety requirements. Connectivity systems commonality & interchangeability across entire fleetsAstronics AeroSat keeps people connected no matter where they fly. For over a decade, Astronics AeroSat has provided fuselage- and tail-mounted SATCOM solutions for general aviation, business aviation, commercial transport, VVIP, and military aircraft around the world. Learn more at Astronics.com. East Aurora, NY | September 4, 2018–Astronics Corporation (Nasdaq: ATRO), a leading provider of advanced technologies for the global aerospace, defense, and semiconductor industries, announced today that its wholly owned subsidiary Astronics Connectivity Systems and Certification has entered into a long-term agreement with Hong Kong Aircraft Engineering Company Limited (HAECO Group). Under the agreement, the two companies will establish a service center to provide Astronics and its airline customers with Line Replaceable Unit (LRU) services in China and Asia Pacific. Ltd. will establish a fulfilment center to provide specialized engineering and component services, including test, maintenance and repair of Astronics CSC’s SummitTM inflight connectivity LRUs. HAECO Component Overhaul (Xiamen) offers extensive experience as the authorized repair center for a wide range of component OEMs, with a proven track record of serving component repair needs of airlines in the region. Astronics Connectivity Systems and Certification serves as the experienced, global market leader for in-flight entertainment and connectivity (IFEC) solutions for aircraft. The Company specializes in connectivity hardware, integration engineering, and certification services. Together with other Astronics subsidiaries, Astronics CSC offers the most complete set of IFEC hardware solutions available from a single vendor. East Aurora, NY | July 31, 2018– Astronics Corporation, a leading provider of advanced technologies for the global aerospace, defense and semiconductor industries, announced today that its wholly owned subsidiary Astronics Max- Viz will offer special prices for its Enhanced Vision Systems (EVS) for experimental and homebuilt aircraft. The special prices are good for orders received at EAA AirVenture Oshkosh July 23-29 and online during the same time period. To qualify for this promotional offer, orders must specify delivery prior to December 31, 2018.
uncertified versions,” said Tom Geiger, Business Unit Manager for Astronics Max-Viz. “During EAA AirVenture, the X1-HR system, normally priced at $18,000, will be available for $16,800. Similarly, the X1 EVS, regularly priced at $6,000, will be $5,700,” he added. The X1+HR sensor uses a sophisticated system with 640×480 pixel resolution long wave infrared thermal imager with electronic zoom to assist pilots of experimental and homebuilt aircraft, which often operate from unimproved airstrips with wildlife and other obstacles. It is compatible with any display that accepts NTSC or PAL/Analog RS-170 signals. The Max-Viz X1 and X1+HR are single line-replaceable units built into an aerodynamically shaped housing for easy installation. The un-cooled infrared detectors output a composite RS-170 video signal, presentable on any analog video-capable aircraft display. The system also features integral window heaters to maintain operation under conditions from -55 degrees Celsius plus automatic pixel recalibration to keep the picture sharp. Both lightweight systems allow pilots to scan the taxi way and runway during takeoff and approach for obstructions, such as wildlife, vehicles, and construction barriers, which may not be visible and are not in any synthetic vision database. The Max-Viz EVS will help pilots see and avoid terrain before the ground proximity warnings. The Max-Viz X1 or Max-Viz X1+HR will enhance safety for the experimental pilot community by enabling pilots to see up to 10 times further than unaided human vision in visibility- obscured conditions, such as smoke, haze and light fog, during the day or at night.. Both systems are uncertified for experimental flying enthusiasts. Astronics Max-Viz will be exhibiting these solutions in Oshkosh, Wisconsin, at EAA AirVenture in Hangar C, booth 3078. With Supplemental and Type Certificates in both fixed wing and rotor wing aircraft, Astronics Max-Viz offers products built on more than 15 years of success in enhanced vision systems. View the EVS offerings in detail at www.astronics.com. East Aurora, NY | July 16, 2018–Astronics Corporation, (NASDAQ: ATRO), a leading provider of advanced technologies for the global aerospace, defense and semiconductor industries, announced today that its wholly owned subsidiary Astronics Max- Viz will offer special prices for its Enhanced Vision Systems (EVS) for experimental and homebuilt aircraft. The special prices are good for orders received at EAA AirVenture Oshkosh July 23-29 and online during the same time period. East Aurora, NY | July 10, 2018– Astronics Corporation (NASDAQ: ATRO), a leading supplier of advanced technologies to the global aerospace, defense, and semiconductor industries, through its wholly owned subsidiary, Astronics Test Systems, announced the shipment of its 2,000th semiconductor tester and that its equipment has tested more than 10 billion semiconductor devices to date. For the past two decades, Astronics Test Systems has served as a partner to the world’s largest semiconductor device manufacturers, helping to ensure that critical electronics go to market with zero defects. from low-volume system-level test (SLT) to massively parallel test solutions, including burn-in tools and system-level testers, to keep pace with the increased volume and complexity of semiconductor units under test. Astronics’ custom test solutions ensure optimal performance of complex electronic products by providing increased test coverage at a lower overall cost of test. “This is an exciting time to design custom test solutions for our semiconductor customers. We are honored by the trust that these companies continue to place in our ability to tackle increasingly complex test challenges,” said Jim Mulato, President of Astronics Test Systems. Innovations in semiconductor technology are driving the momentum for SLT. Moore’s Law not only reduces the size of transistors, but also causes a proportional increase in untested transistors as well as yield overkill, also described as “throwing away good parts.” Astronics SLT solutions improve fault coverage despite these new test challenges. Automotive semiconductor devices are newcomers to SLT and gaining more attention in the test industry. Astronics Test Systems will be at SEMICON West, presenting “Key Considerations for an Automotive Semiconductor SLT Strategy,” at the Test Vision 2020 workshop. To learn more, visit Astronics Test Systems in booth 2405, July 10-12, 2018 at SEMICON West in San Francisco, California, or online at Astronics.com. East Aurora, NY | May 15, 2018– Astronics Corporation (NASDAQ: ATRO), a leading provider of advanced technologies for the global aerospace, defense and semiconductor industries, announced that Norwegian Air Shuttle (NAS) has selected the webFB® Wireless Electronic Flight Bag device, offered through its wholly owned subsidiary Astronics Ballard Technology. NAS will install the webFB on all of its Boeing 737 Next Generation (NG) aircraft to improve and automate aircraft data collection. Astronics participated with NAS in a year-long operational trial of the webFB to validate the suitability of the device in operation and the economic benefits of the solution. In the application, the webFB gathers data from the aircraft’s ARINC 717 databus and wirelessly routes it to the electronic flight bags (EFBs), where it is automatically transferred by NAS to a data center and used for post-flight analysis. With the webFB already operating on 10 aircraft, NAS will install the product on all of their additional Boeing 737NG aircraft. East Aurora, NY | May 15, 2018– Astronics Corporation (NASDAQ: ATRO), a leading provider of advanced technologies for the global aerospace, defense, and semiconductor industries, announced today that its wholly owned subsidiary, Astronics Connectivity Systems and Certification (CSC), recently received Supplemental Type Certificates (STCs) for retrofit installations of Astronics’ EmPower® in the flight deck on multiple Boeing aircraft types. Astronics CSC completed the STCs in conjunction with retrofit projects for multiple airlines, in which more than 600 aircraft will provide the EmPower outlets for pilot use. on Boeing 737, 757, 767, and 777 aircraft. Astronics expects to receive additional STCs for more Boeing and Airbus aircraft later this year in conjunction with additional airline retrofit programs. Airlines can leverage these STCs for quick and simplified installations of EmPower flight deck power. Pilots are increasingly using electronic flight bags (EFBs) and the number of real-time applications they are using on those devices is rising. Increased usage can drain power, and airlines are requiring easily accessible outlets integrated into the flight deck. Astronics’ EmPower products are already a standard linefit option on Boeing and Airbus, and these new STCs represent an additional retrofit opportunity for airlines to provide consistency within their fleets.